If your school doesn't have a transportation program or funding for your current option is being cut, look into offering the Student Pass. School administrators can provide students with reliable transportation for a fraction of the cost of yellow school buses, and students receive unlimited rides for one low price. Student Pass is available to all high schools. The minimum purchase is five Student Passes per quarter. To participate in the Student Pass program, complete the application. The student must agree to Metro Transit’s Code of Conduct to use the pass. Any violations of the Code can result in pass deactivation by the school administrator or Metro Transit. Often schools include addendums to Metro Transit’s Code of Conduct, such as policies about pass use if the student is truant repeatedly. A valid student ID must be presented when riding. The photo ID allows Metro Transit Police to determine validity and prevents fraudulent use by someone other than the student. Users must validate each ride by touching a Student Pass to a card reader every time they board a bus or train. Without validation, the ride is not counted and Metro Transit Police cannot verify that the pass is active and valid. 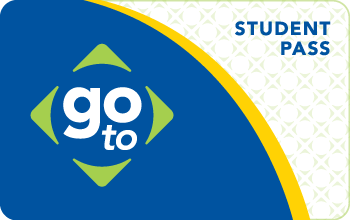 Metro Transit reserves the right to deactivate the pass of any student who does not comply with fare policy. For details on how the card works and how to take care of it, read the User's Guide. Each school assigns an administrator to manage the Student Pass account. This is done through an online administrator site, which makes it easy to track current passes and students, temporarily suspend or cancel passes, issue replacement passes and manage billing information. At the beginning of the school year, the school administrator receives Student Passes that are ready to be issued; they are already valid for unlimited rides on buses and light rail so it is very important to track every pass. The school will be billed for each pass that is in use after the initial purchase or in subsequent billings. Upon acceptance to the program, you will be sent an email invitation to set up your access to the online administrator site. Once you have access, begin distributing Student Passes and recording which pass was given to each student. A first and last name is required for each pass distributed to ensure proper billing. If a student's pass is no longer needed, promptly deactivate it to avoid paying for an additional quarter. If a student's pass is lost or stolen, the administrator should deactivate the old pass and issue a replacement from the initial shipment. If you do not have any unissued cards, place an order for additional cards to be kept in inventory. A $5 fee will be charged for a replacement pass unless the pass is deemed defective (it has no apparent physical damage and cannot be read properly). Defective passes must be returned to Metro Transit for verification as soon as possible. A credit will be issued to the school at the end of the billing period for the total number of deactivated passes that were replaced. The credit amount is the difference between the cost of the pass and the replacement fee (for example: $97 less $5 replacement fee = $92 credit). An administrator can temporarily suspend a student’s pass. There is no replacement fee because a new pass is not issued. The school is invoiced four times per year; each pass costs $97 per quarter. At the end of each quarter, the administrator downloads an "active pass" report from the administrator site. The administrator verifies the list of active passes and indicates which passes have not been issued (these should be noted by those without names assigned) and cancel any passes as necessary. Prior to the billing cycle, you will be reminded via email, to confirm the number of cards currently issued/registered. If no confirmation is received, we will invoice you for the total number of cards active under your account. After June 15, the school must return any unassigned passes to Metro Transit. Metro Transit will then issue a credit of $97 for each pass returned. Returns must be received no later than July 15. Metro Transit sends ‘School A’ 100 Student Passes based on the administrator’s estimated demand. School A issues 90 passes during the first week of classes. During Q1, School A issues three additional passes to new students. At the end of Q1, the administrator site indicates there are 93 assigned passes. During Q2, a student at School A loses his card. A replacement is issued from the original shipment and the original pass is canceled (deactivated). No other changes occur. During Q3, two new students enroll in the program. There are now a total of 95 passes in the active pass list. No changes occur during Q4. At the end of the quarter, there are four passes remaining from the original shipment (one was used to replace a lost pass). The administrator returns the four passes by July 15. Metro Transit issues a refund or credit in the amount of $388 (4 passes x $97). Display brochures and posters in high-traffic areas to promote the Student Pass. If you would like a customized brochure printed in large quantity (over 1,000 copies) or a customized poster, please contact the outreach specialist in your area or contact Metro Transit to learn about options. Contact us or the outreach specialist in your area with any questions about the Student Pass program.